Wangaratta Shire (1867-1994) was proclaimed on 17 September 1867, its area being based on a road district which had existed for four years. 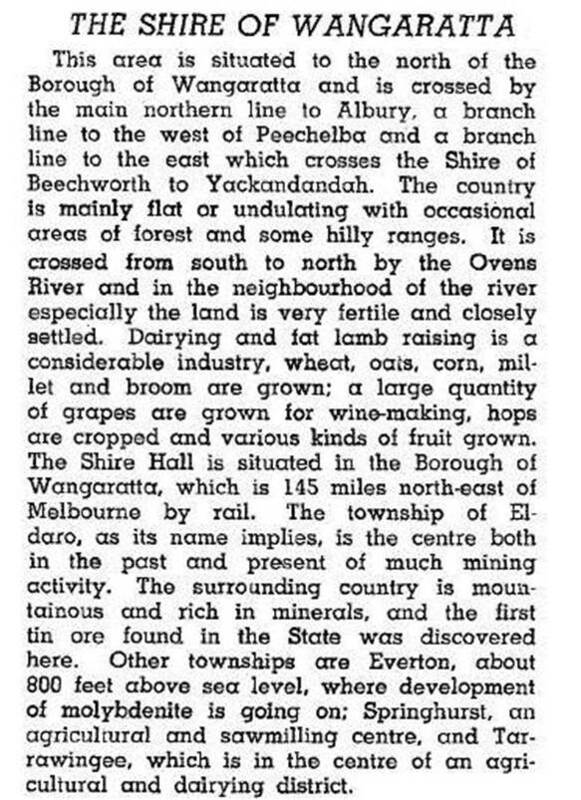 It was named the North Ovens shire, which was appropriate because the shire was almost completely north of the Wangaratta borough and it was bisected by the Ovens River. The change of name from North Ovens to Wangaratta occurred on 22 November 1916. In 1994 nearly 62,000 hectares, or two thirds of the shire's area, was farmland. There were over 95,000 sheep and lambs and over 24,000 meat cattle. There were small areas growing cereals and fruit trees, and some dairy cattle. The unfarmed areas included the Warby Ranges in the south-west of the shire and forested areas in the south-east. On 18 November 1994, Wangaratta shire was united with Wangaratta city and parts of three other shires to form Milawa shire, later Wangaratta Rural City.